1Associate Professor, Department of Agricultural Extension and Education, Faculty of Agriculture Engineering and Rural Development, Ramin Agriculture and Natural Resources University of Khuzestan, Ahvaz, Iran. 2PhD Candidate, Department of Agricultural Extension and Education, Faculty of Agriculture Engineering and Rural Development, Ramin Agriculture and Natural Resources University of Khuzestan, Ahvaz, Iran. 3Professor, Department of Hospitality and Tourism Management, School of Business, College of Charleston, Charleston, Carolina, USA. Purpose: Not all groups in a rural community are expected to be homogeneous in their attitudes towards tourism development. For example, gender is a fundamental means to understand such differences. This paper examined the gender differences in support of rural tourism development. Methods: This is a cross-sectional study. Oraman County, one of the most attractive places for tourism in Iran, is taken as a study area to verify gender differences toward tourism development. Using a snow-ball sampling method, 134 people agreed to participate in the study. The study data were collected using a self-administered questionnaire. All the study variables used continuum scales. The obtained data were analyzed by SPSS and AMOS. Results: The results revealed that men were more motivated than women to support and engage in tourism development activities in their communities. 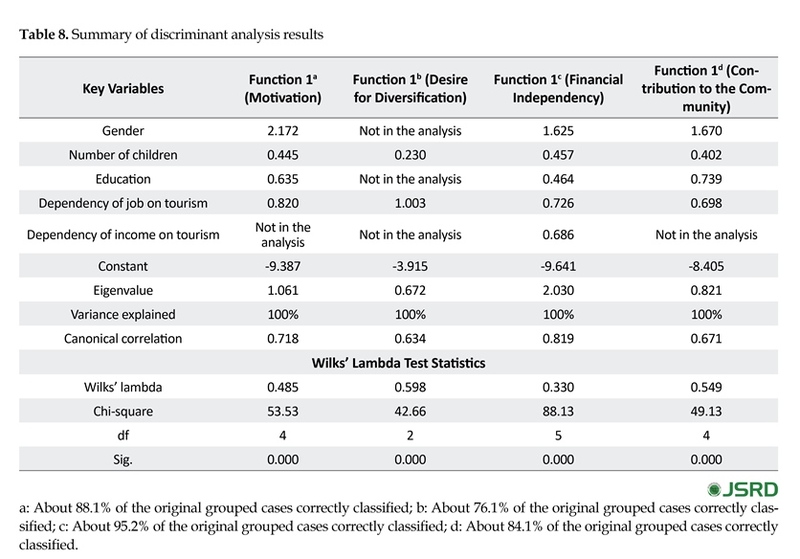 The result of a discriminant analysis revealed that such factors as “contribution of tourism to the community” and “desire for diversification” made a statistically significant contribution to the discriminant function. In other words, these factors contributed to a statistically significant separation between genders of the respondents. 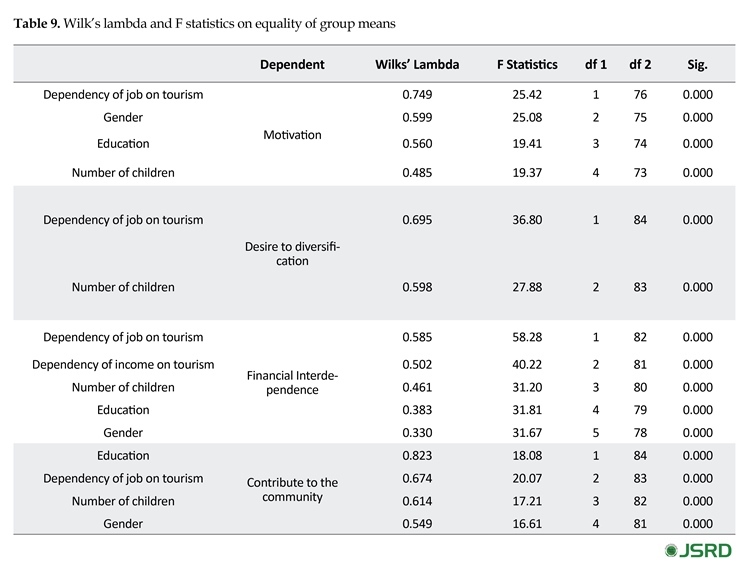 In addition to gender, the respondent’s number of dependent children, education, and the dependency of their job on tourism made a statistically significant contribution to the discriminant function of motivation to participate in tourism activities. Conclusion: On the whole, the constructs used by McGehee et al. (2007) (replicated in this study) have the potential for assessing motivation to participate in tourism activities. However, gender comparisons on motivation revealed significant mean differences between males and females. Rural communities often experience economic hardships due to declining demand and prices for locally produced commodities, or the reduced need for labor to extract these resources (Látková & Vogt, 2012; McGehee & Kim, 2004). Tourism can be an important means of economic development and income diversification for many of these communities. However, it can also have negative impacts, including disruptions of community life, environmental degradation, increased demand on public services, inflation, and so on (Abdollahzadeh & Sharifzadeh, 2014; Skanavis & Sakellan, 2008; Crotts & Holland, 1993). Many people think that assessing local residents’ support and likely participation in a community’s tourism development plan is an essential early step in tourism planning to avoid implementing a development strategy where economic interests become at odds with local residents’ desires and quality of life (Látková & Vogt, 2012; Long, Perdue & Allen, 1990). For a sustainable rural tourism, a positive interaction between residents and tourists must be developed that can only be maintained when residents believe that tourism development and residents’ quality of life complement one another (Ghanian, Ghoochani & Crotts, 2014). Not all groups in a rural community are expected to be similar in their attitudes towards tourism (Látková & Vogt, 2012) and gender provides a fundamental means to gain insights into such differences regarding support for any economic development option including tourism. Though gender differences derive from biological factors (Ramkissoon & Nunkoo, 2012), they are reinforced by societal norms and roles that guide judgments and decisions, particularly in cultural settings where males dominate the traditional workplace and women do the family household (Reisinger & Crotts, 2009; Kim, Lehto & Morrison, 2007). Based on prior research, women are usually more devoted to their communities then men (Rollero & De Piccoli, 2010; Hidalgo & Hernandez, 2001) and evoke a higher concern for initiatives when their local communities are impacted (Davidson & Freudenburg, 1996; Zelezny, Chua & Aldrich, 2000). If the residents’ support for tourism development is significantly different between males and females, such an understanding may provide community leaders a better foundation for creative solutions and plan an enlightened development strategy that will better serve all residents’ social and economic interests. Where traditional gender roles dictate lower community leadership roles for women, the social justice would call for their opinions to be equally solicited. Moreover, since small family-run businesses are the economic driver of rural tourism development (Hallak, Assaker & Lee, 2015; Getz, Carlsen & Morrison, 2004), the success of these enterprises will be enhanced by committed husband and wife teams whose individual concerns and interests are taken into account. In a study of entrepreneurial motivations of agricultural tourism operators in Taiwan, Lin, Wu and Morais (2013) found that men were motivated to engage in agritourism in an effort to improve their economic status. Women, on the other hand, were motivated to participate in order to improve the quality of life in their community. We argue that if tourism can complement both motives, it will have the best chance to produce profitable and sustainable rural tourism economy. Oraman County in Iran has the potential to become the hub for rural tourism in the western region of the country. Realizing this potential requires proper planning and engaging its residents, half of them are women. Women play a key role in the tourism development. In most rural areas of Iran, women make most of the handcrafts sold to tourists accounting for a significant proportion of the tourism economy of their host communities. This economic income has the potential to empower them towards even more prominent roles (Ghanian, Ghadiri Masoum, Motiee langerudi & Zarafshani, 2010). In this regard, this research is focused on identifying what differences, if any, exist between males and females in terms of their motivations to participate in tourism entrepreneurial activities. In particular, the desire for financial independence, diversification, and perception that tourism could contribute to the community were factors derived from the literature that contrasted between males and females, and between the factors themselves. This research extends upon the work of McGehee & Kim, 2004 who framed the underlying factors for agritourism entrepreneurship. Specifically, this research tried to answer the following questions: Which one of the motivational constructs are different between male and female respondents? ; Are there associations between the motivational constructs? ; Which demographic variables can affect the motivational constructs? The theoretical framework of this research is based on social exchange theory (Turner, 1974) where the exchange of economic and social resources forms the basis of all human interactions (Abdollahzadeh & Sharifzadeh, 2014). In the case of tourism, residents will demonstrate more willingness to enter into exchanges with tourists if they receive more benefits than costs (Zhang, Ghoochani, Pan, & Crotts, 2016). This principle explains why so often residents who perceive gaining more benefit from tourism are more supportive of tourism development and have more positive reactions toward tourists (Jurowski, Uysal & Williams, 1997; Long, Perdue, & Allen, 1990; Pavlić, Portolan, & Puh, 2017). However, where tourism is not properly developed, making a pre-planned distinction between those who are directly involved in tourism enterprises and those who are not provide a means to understand the predicted variability in support for a potential tourism development strategy. Social role theory also provides a unique framework for understanding the expected variability in support for tourism (Gibson & Pennington-Gray, 2005). 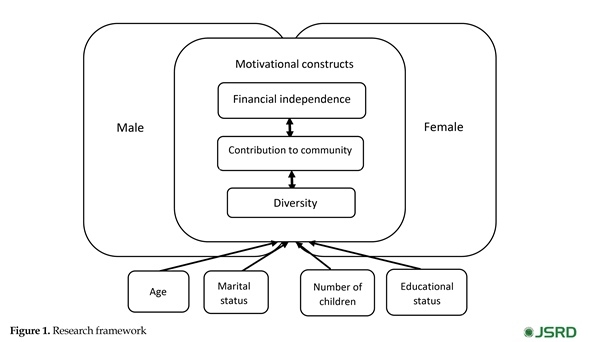 The framework would suggest that male behavior in traditional culture is associated with assertiveness, self-interest, and independence (Reisinger & Crotts, 2009; Kim, Lehto, & Morrison, 2007), which in this study should be associated with financial independence and the desire for diversification. On the other hand, traditional female behavior is more often associated with personal affiliation, social empathy, and sensitivity to the concerns of both self and others, which should evoke a desire to contribute to the community’s infrastructure and quality of life. Given that gender separates any community into roughly equal halves, such propositions, if supported, would provide a potentially useful framework to address community interests in developing an appropriate tourism development plan. The literature on gender differences on decision making is extensive. A number of studies have found that women frame problems and solutions in ways different from men. Partly, because women are socialized to be more empathic, caring of others and the environment, more interdependent and collectivistic, and are likely to be more adept at teamwork (Skanavis & Sakellari, 2008; Zelezny & Bailey, 2006; Zelezny et al., 2000; Gilligan, 1982). These attitudes and behaviors ultimately influence information processing and decision making, where women engage in decision making that is more effortful and comprehensive when compared to males engaged in selective information processes (Ramkissoon & Nunkoo, 2012). In addition, Hallak et al. (2015) found that gender had a moderating effect on entrepreneurial readiness, and ultimately satisfaction, with business performance among tourism entrepreneurs in Australia. Among men, entrepreneurial self-efficacy had a direct and robust association with their satisfaction with their businesses performance. On the other hand, one factor in entrepreneurial self-efficacy - defining a business’s core purpose modified by a high degree of place attachment - was also robustly associated with the satisfaction with their business performance. If such findings are generalized to other national cultural settings, we should expect more thoughtful and cautious support for tourism development among women particularly in rural areas where gender norms and roles are more pronounced and conservative. The study has a cross-sectional design. Considering the study purpose, the authors tried to evaluate the motivation towards tourism development among those people who have previously played a role in the tourism economies in their communities. Employing a snow-ball sampling method, the authors were able to enroll the study sample for survey purposes. A total of 198 people residing in Oraman County with experience in organizing programs and activities around tourism were identified. Of them, 134 people agreed to participate in the study when eventually had a response rate of 67.6%. The demographic data of the respondents revealed that they were mostly 36 years old or younger (62.7%), male (68.7%), married (71.6%), with less than 3 children (40.3%). In addition, the results showed that three-fourths of the respondents passed some level of a formal educational degree (73.2%). The result also showed that nearly one out of five respondents (17.9%) reported that their current job was not related to tourism at all. In addition, some respondents (37.3%) mentioned that 10% of their income is derived from tourism indicating that greater than one half of all respondents that they cannot earn enough money to sustain their livelihood from the current level of tourism activities in their communities. The data were based on a face-to-face surveys of the respondents. All questionnaires were checked to make sure that responses were complete. No payment was made to the participants. Oraman County, located in Kurdistan Province, is one of the most popular tourist attraction places in Iran. This county contains several traditional Kurdish villages. Inhabitants and their language are known as Hawrami, one of the famous dialects of Kurdish language and similar to Avestan, which was spoken by ancient Zoroastrian. The region is recognized as the heart of pre-Islamic Zoroastrian custom and many local words relate to the Sassanid dynasty (226–651 AD). The weather is pleasant in spring, summer and fall, but cold in winter. Agriculture is constrained by the climate and rocky terrain, but orchards thrive and the land is covered with walnut, pomegranate, fig, and mulberry trees. Villagers commonly live in houses made of stone with beamed ceilings, constructed in a stair-like fashion so that the roof of one house is the courtyard of another. The mountainous county contains many historic, cultural, and natural attractions. Key attractions are the architecture, heritage buildings, folklore, customs, carvings and other craftwork and natural beauty. Although there are no official figures, the village council estimates around 150000 visitors every year, mainly from early spring to mid-autumn (March through to early November); only about 500 tourists are from overseas, and they usually come at the time of the religious celebrations (Ghaderi & Henderson, 2012). The region is in close proximity to conflict zones in Syria and Iraq. However, the area is politically stable and safe for visitors, and with the potential easing of international travel restrictions, is poised for tourism development if the resident population is receptive and willing to participate. This study was conducted to explore the residents’ motivation towards tourism development. The study data were collected from those people using a self-administered questionnaire, along with interviews with the respondents. The face validity of the questionnaire was confirmed by a panel of faculty members of the Tehran University. Also the reliability of the questionnaire was confirmed by calculating the Cronbach α in a pilot study. The alpha coefficient for the constructs were 0.88 for the motivation, 0.79 for the “desire for diversification”, 0.84 for the “financial independence”, and 0.86 for the “contribution to the community”, which all of them were higher than acceptable rates. 2) dependency of their job and income on tourism, and 3) motivation to participate in tourism activities across three constructs (i.e. financial independence, contribution to community, and economic diversity). Figure 1 shows the research framework. Responses were scored along a continuum scale from 1= fully disagree to 10= fully agree. Table 1 presents the survey items in the questionnaire and the descriptive statistics of each item. As showed in Table 1, the values of skewness and kurtosis of all items did not detect any serious violations of normality, because all the coefficients were below ±2. The summation of the answers to all indicators for each construct was computed as the score of that construct. Data were analyzed by SPSS (version 20) and AMOS (version 20). All questionnaire data were initially input into SPSS, which was used to perform descriptive statistics, mean difference and K-mean cluster analyses. Also the authors applied a Confirmatory Factor Analysis (CFA) to determine whether measures of a construct were consistent with a researcher’s understanding of the nature of that construct or not. In this regard, Bollen (1989) recommended the normal-theory maximum likelihood (MLE) method, which is consistent with the small sample size (n=134), and so that used to test the adequacy of the measurement model (Hall, 2008). In order to explore the association between the subconstructs of motivation and participation in tourism activities (i.e. desire for diversification, financial independence and contribution to the community), a series of Pearson correlation coefficients were calculated (Table 6). As shown in Table 6, there was a significant, positive, and robust correlation between “desire for diversification” and “financial independence” (r=0.756, P<0.01), between “contribution to the community” and “financial independence” (r=0.403, P<0.01), and to a lesser degree between “desire for diversification” and “contribution to the community” (r=0.415, P<0.01). This indicates that all of these subconstructs have positive associations. ticipate, Analysis of Variance (ANOVA) was used. This process was performed for all the subconstructs of motivation for participating in tourism activities. The results of cluster analysis are presented in Table 7. In seeking to understand the motivation to participate, it was necessary to take into account the influence of some other variables that may have been important in determining the motivation and also in the subconstructs of motivation. Hence, for the purposes of this study, socioeconomic variables were essentially used to describe and characterize the motivational factors for the participation. In this regard, discriminant analysis was conducted to assess how accurately individuals were classified to the clusters. For each factor, one discriminant function was calculated, using discriminant analysis, with the two clusters identified by cluster analysis as dependent (Table 8). 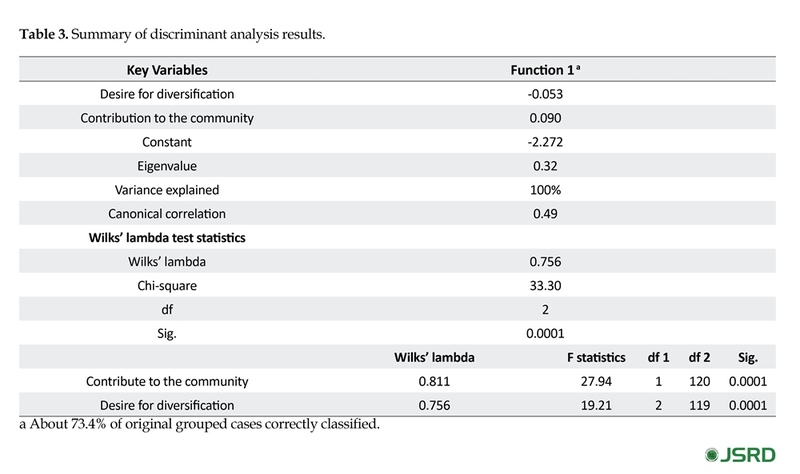 To test the statistical significance of each of the discriminant functions, Wilks’ lambda test was conducted. The Chi square test result was 53.53 (df=4; P<0.001). Thus, the derived discriminant functions were statistically significant. As can be seen in Table 8, for each subconstruct of motivation to participate in tourism activities, one function was produced. To test the statistical significance of all functions, Wilks’ lambda test was conducted. The Chi-square test results were 42.66 (df=2; P<0.001) for “desire for diversification”, 88.13 (df=5; P<0.001) for “financial independency”, and 49.13 (df=4; P<0.001) for “contribution to the community.” Thus, the derived discriminant functions were statistically significant. In more detail, Wilks’ lambda test and F-statistics were used to analyze the statistical significance of each motivational dimension included in the discriminant functions (Table 9). 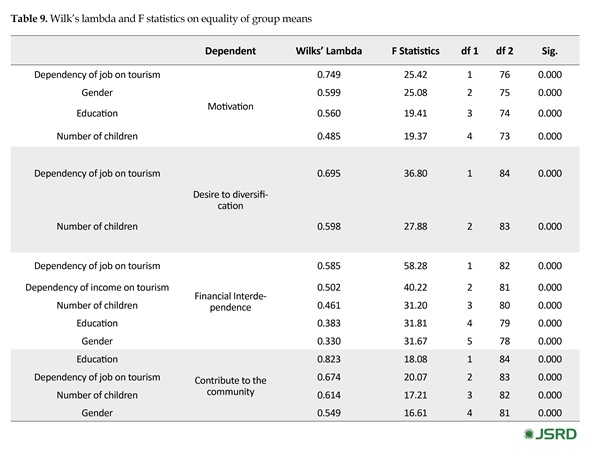 The tests showed that gender, number of children, education, and the dependency of their job on tourism made a statistically significant contribution to the discriminant function of motivation to participate in tourism activities. In other words, these variables contributed to a statistically significant separation between respondents’ motivations to participate. The results also revealed that the dependency of a job on tourism, and the number of children, made a statistically significant contribution to the discriminant function of desire for diversification. The discriminant function of financial independence was statistically separated by dependency of job on tourism, dependency of income on tourism, number of children, education and gender. Also education, dependency of job on tourism, number of children and gender contribute to a statistically significant separation between the respondents’ motivations to participate. It is worthwhile to mention that gender had the potential to separate all motivational constructs except the desire for diversification. 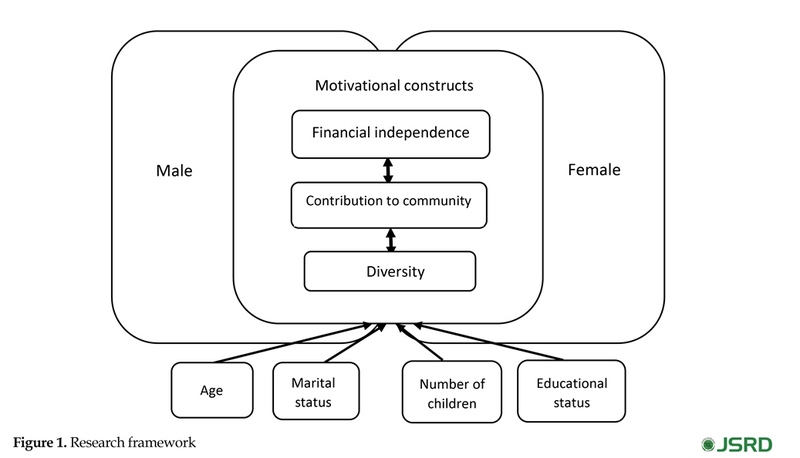 Overall, the derived discriminant functions of “motivation to participate”, “desire for diversification”, “financial independence”, and “contribution to the community”, could classify 88.1%, 76.1%, 95.2% and 84.1% of the cases, respectively. More specifically, among the respondents with low motivation to participate (total=32), 93.8% of the respondents were rightly classified, and among the high motivated respondents (total=100), 86.3% of the respondents were correctly classified (Table 10). In this same manner, among the low desire for diversification respondents (total=52), 65.4% of the respondents were correctly classified, and among the high desire for diversification respondents (total=40), 90% of the respondents were correctly classified. The most accurate classification result was for the financial interdependence function. This function classified 95.2% of high and low financial interdependence respondents correctly. And the last function classified 86.7% of low contributes to the community respondents and 82.8% of high contributes to the community respondents, correctly. 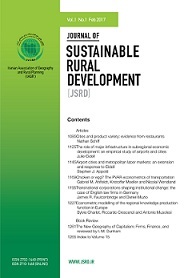 This study examined the gender differences in support of rural tourism development extending upon the work of McGehee and Kim (2004) who framed the underlying factors for agritourism entrepreneurship. Residents of Oraman County with their current tourism activities in the region were selected as the sample group for this survey research. The first step in the data analysis was a confirmatory factor analysis employed to examine whether measures of each construct were consistent with a researchers’ understanding of the nature of that construct. The results revealed that the data had a good fit with the constructs. This finding is in line with McGehee and Kim (2004) results. Gender comparisons on motivation revealed significant mean differences between males and females. Men showed more motivation towards development of tourism activities in their communities than females. This finding is in line with the Ghanian et al. (2010) who stated that men and women have different reasons for tourism development. It is also in line with Ribeiro, Valle & Silva (2013) but is contrary to the finding of Almeida-García, Peláez-Fernández, Balbuena-Vázquez, & Cortés-Macias, (2016) that found no effects of gender on residents’ perceptions of tourism’s impact. The results showed that the “desire for diversification” and “contribution to the community” have discriminatory power between male and female and in both constructs men were more motivated than women. Also financial independence had a positive association with two other motivational constructs of research. It may be interpreted that because neither males nor females earn enough money from tourism activities to support themselves or their families, they are not as supportive. However, if tourism could become a viable means to earn more money, then they might be more motivated to participate in tourism development. The results of discriminant function by gender showed that both men and women were motivated by financial independence. groups of high and low desire for diversification. It can be concluded, as mentioned before, that both men and women are motivated by financial independence. However, in the cultural context of this region, although there is not a big obstacle to prevent the participation of women to earn money, it is not considered socially acceptable for a woman to earn more money than a man, and also it is preferred that women focus on making contributions to the community. Therefore in this cultural context, men are more motivated by financial independence. In this regard, Tran & Walter (2014) confirmed that in planning and developing of tourism endeavor, the gender perspectives should be considered and planned tourism development may result in much more positive benefits for local women participants. Another noteworthy point of this analysis was about the discriminatory power of dependency of income on tourism activities. There is discriminatory power only for high and low levels of financial independence. The people in this region see tourism as a cultural activity (e.g., religious pilgrimage) and not as a financial activity, making it difficult to discriminate between the two levels of the other motivational constructs. Generally, the constructs that McGehee and Kim (2004) mentioned have the potential for assessing gender motivation to participate in tourism activities. However in this case, the sociocultural context of each region may affect the motivation to participate in tourism activities. Davidson, D. J., & Freudenburg, W. R. (1996). Gender and environmental risk concerns: A review and analysis of available research. Environment and behavior, 28(3), 302-339. Getz, D., Carlsen, J., & Morrison, A. (2004). The family business in tourism and hospitality. Wallingford: CABI. Ghanian, M., Ghadiri Masoum, M., Motiee Langerudi, S. H., & Zarafshani, K. (2010). [An analysis of rural tourism as perceived by the host community:A Gender Approach (case study: Oraman) (Persian)]. Women in Development & Politics, 8(3), 93-109. Gilligan, C. (1982). In a different voice. Cambridge: Harvard University Press. Hooper, D., Coughlan, J. & Mullen, M. R. (2008). Structural equation modelling: AGuidelines for determining model fit. The Electronic Journal of Business Research Methods, 6(1), 53–60. Skanavis, C., & Sakellari, M. (2008). Gender and Sustainable Tourism: Women’s Participation in the Environmental Decision-Making Process. European Journal of Tourism Research, 1(2), 78-93. Turner, V. (1974). Dramas, Fields and Metaphors: Symbolic Action in Human Society. Ithaca: Cornell University Press. Zhang, H., Ghoochani, O. M., Pan, B., & Crotts, J. (2016). A Case Study on the Impact of Personal Characteristics on Residents’ Support for Tourism Development. Paper presented at The 2016 ttra International Conference. Vail, Colorado, USA, 14 June 2016.